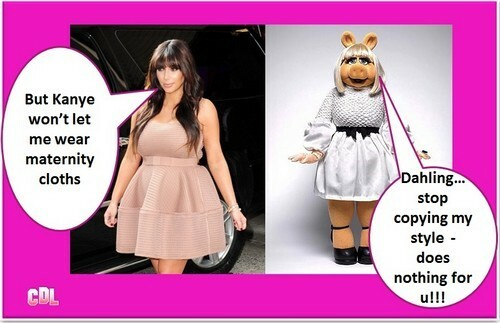 Let me start by apologizing to Miss Piggy! Pregnant Keeping Up With The Kardashian’s star Kim Kardashian stepped out in the worst pregnancy outfit I have seen yet. Kim was in New York City yesterday [March 26th, 2013] when she wore the unflattering dress. We have more photos for you of Kim in the dress and I gotta say she certainly looks like she has packed on the pounds. Maybe she can approach Weight Watchers and try to get the same deal that Jessica Simpson did. What do you think Hiccupers? Are you loving Kim’s maternity fashion YAY or NAY? To check out Kim Kardashian and more of her pregnancy looks GO HERE!